Nalaxone is a chemical that when delivered to the brain can block the natural endorphins which are responsible for the ecstatic responses experienced while listening to music. 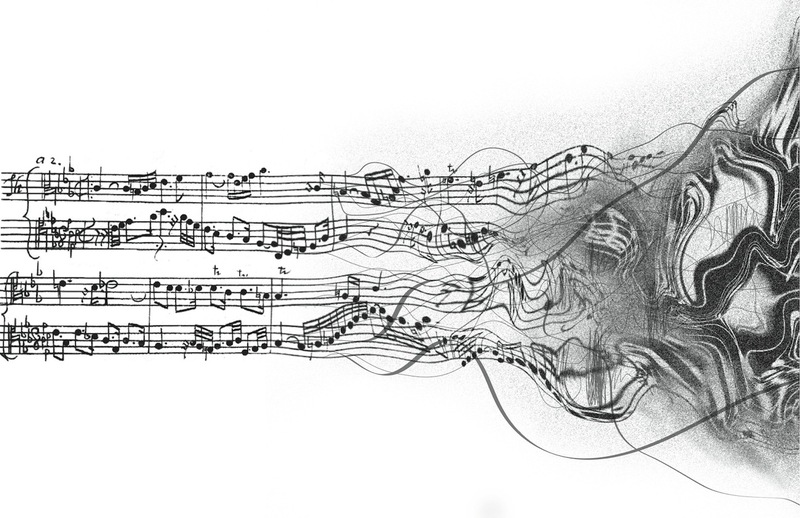 If certain chemicals can inhibit musical perception, then other chemicals must stimulate them. Imagine that you could experience a complete musical composition by simply taking a pill. For example, a musical composition might be encoded chemically into the molecular structure of the grains contained in a time-released capsule. The musical information encoded in the capsule would be sent to the brain, sequentially, through the bloodstream. The molecules encoding the music would trigger various nerve cells, gradually releasing the neurotransmitters that communicate with associated neurons in the auditory regions of the brain. Ultimately, the music would be processed in the brain, as it would normally, exciting a wide range of emotional, intellectual, or physical responses, depending on the nature of the musical composition. The brain can produce spontaneous musical perceptions without the need for external auditory stimulation. It does this by directly stimulating musical perceptions, such as in a dream state. Dreams are creative. Our brain creates as we dream. The brain retrieves bits and pieces of memory spontaneously, and combines them to form new images. And the brain alone is capable of creating other sensory experiences, including completely new sounds, as well as entire musical events. The fidelity of these sounds is increased in comparison to normal listening, due to the electrical environment of the brain. The tones of the musical scale, noises, most speech sounds, and thousands of musical patterns are all stored in the human brain during the course of a lifetime. During REM dreaming, auditory memories are combined spontaneously to form firing patterns which result in new sounds, or new musical sequences. Familiar sounds are re-created from existing memories, and incorporated into the dream scenario. Dreams have been reported in which original musical compositions, ranging from popular songs to complex orchestral music, occur spontaneously within the brain. Perhaps a set of electrical probes could be implanted in a control center of the brain, such as the thalamus. Given a signal in the form of a thought command, the probes could stimulate the auditory cortex, similar to the dream process, creating a sequence of musical perceptions strictly controlled within the brain. Finally, consider the variety of sounds which propagate in various media including gas, liquids, organic and inorganic solids, and plasmas. Many of these sound patterns occur outside the threshold of human hearing. They range from tiny microacoustic sounds in a plasma, to macroacoustic waves, including ocean waves, seismic waves, global waves, solar waves, and galactic waves. They are propagated in the Earth’s air, water, and land, as well as on or near other planetary bodies and satellites, in stars and galaxies, in the solar wind, and in interstellar and intergalactic clouds. An auditory implant device could be inserted in the brain in order to detect these sounds. The frequencies would have to be transposed up or down many octaves. And the amplitudes would require adjustment. The octave displacements and amplitude range would be tuned to the spectrum of human hearing, and could be stored and processed in the brain as auditory perceptions. We would be able to hear, for the very first time, the continuum of interactive sound events which occur throughout the universe at various orders of magnitude and scale.